Are you ready for some epic party cuteness this holiday season? This DIY serves as the proof that I’m a serious procrastinator. Well, cutting myself some slack here, let’s just say I tend to bite off more than I can chew. I planned to make these last year, but never got around to it. Not only did I plan it, the supplies were already purchased too. Oops. Though, it was fun stumbling on them this year and having an instant project to make. 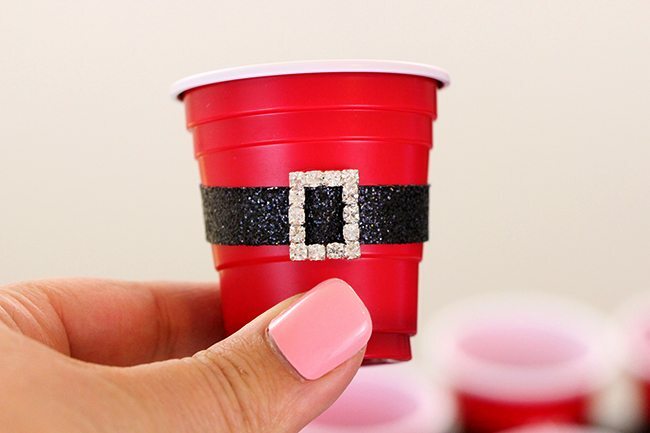 So, let’s get to it and make these DIY Mini Santa’s Belt Cups. This post contains affiliate links. 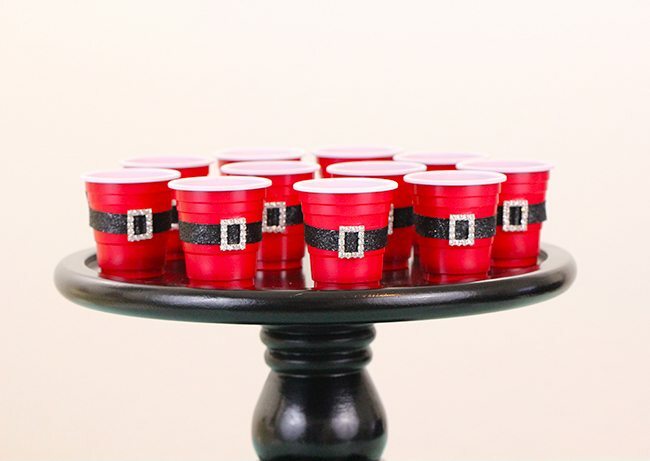 Last year, I shared this idea using Solo Cups and they were a gigantic hit! Over 100,000 pins on Pinterest alone! I was not only shocked, but elated. I just had to make these in mini form because… how stinkin’ CUTE are mini cups?? The cute minis, are very simply made with red mini cups, black ribbon, buckles and glue (or glue dots). Just a handful of minutes to put together but totally worth the smiles you’ll get at your holiday parties. *3/8″ Black Ribbon I had some on hand that had a little sparkle to it which worked really nice. *17 mm Buckle Sliders / These are Square-shaped “Rhinestone Buckle Slider for Invitation Wedding Letters”. I’ve also found similar options at Walmart in the sewing/craft section as well. Look where you would find buttons and regular clothing buckles. *Glue Gun, Super Glue or Mini Glue Dots. I prefer & recommend Glue Dots for this, it’s a non messy quick way to get the ribbons to stick on as straight as possible. 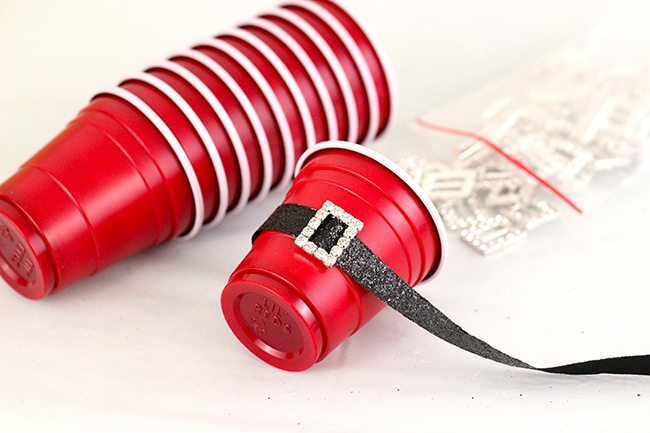 *Measure out the amount of black ribbon it takes to wrap perfectly around the middle of your mini cups and trim. *Use choice of glue or Glue Dot to secure and adhere the ribbon around each cup. That’s it! See, so easy! 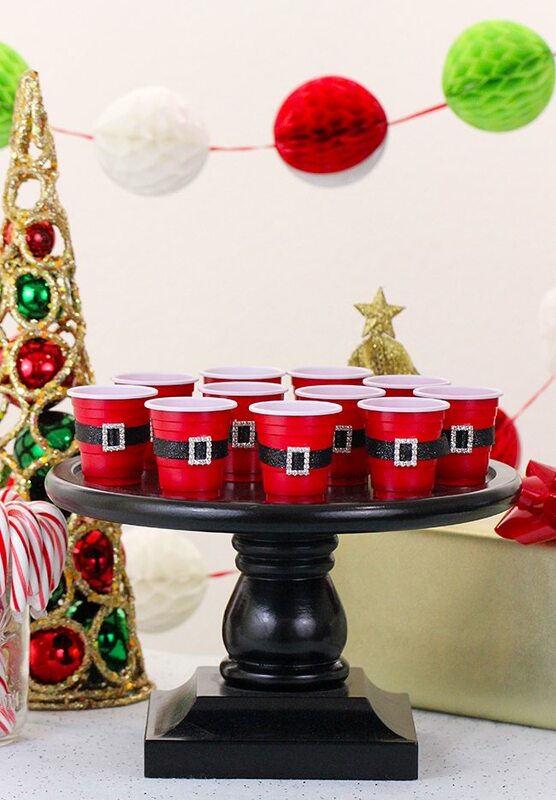 Now, you’re ready to serve up some mini holiday drinks! Fun for the kids but dare I say even more fun for adults? Get more Christmas Inspiration here. What DIY projects are you up to this holiday season?